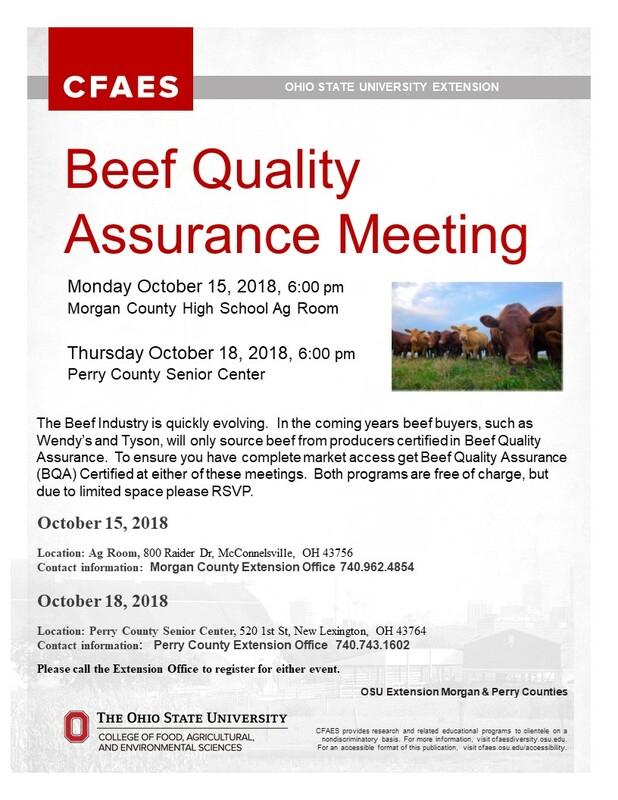 The Perry County Ohio State University Extension will hold a Beef Quality Assurance Meeting on Thursday, October 18, 2018 at 6:00 p.m. at the Perry County Ohio Senior Center - New Lexington, OH. The Beef Industry is quickly evolving. In the coming years beef buyers, such as Wendy’s and Tyson, will only source beef from producers certified in Beef Quality Assurance. To ensure you have complete market access get Beef Quality Assurance (BQA) Certified at either of these meetings. Both programs are free of charge, but due to limited space please RSVP. Please call the Extension Office to register for either event.